So after hearing that one of the four places that had Kinect on display was Arizona, I knew I had to go no matter where the store was. Arizona is like only 6 hours wide and tall in all directions so it would be no problem. 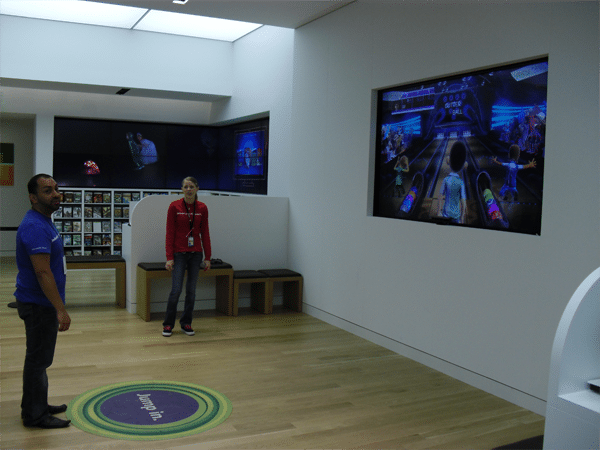 Well I get in my car and drive to the mall that has the Microsoft store displaying Kinect. When I walk in I am looking for some small kiosk in the corner but I didn’t look too long as right dead center in the back of the store was a huge TV with a ton of people around it screaming, jumping and laughing. Crazy kids doing what they do best! 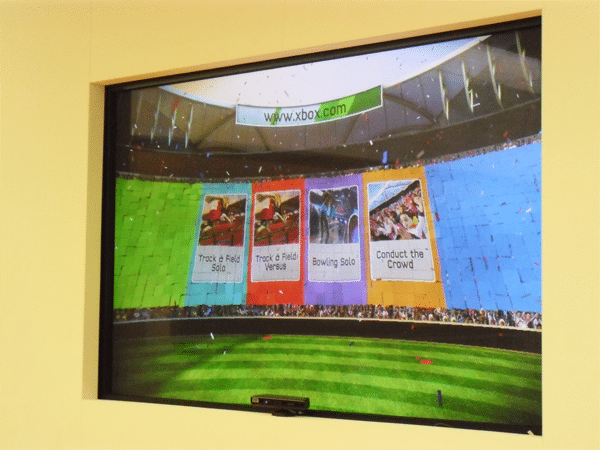 Kinect Sports menu! We got Solo and Team Track & Field, Bowling and Conduct the Crowd. 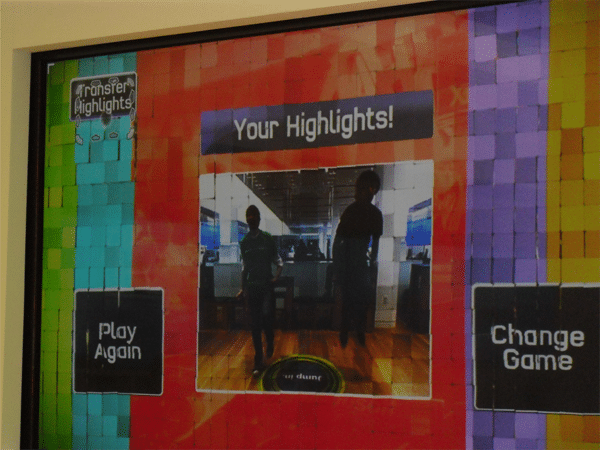 Kinect Sports! Another one of the kiosk workers steps up and tells me is going to show me bowling (like I need to be shown how to bowl…it’s supposed to be like real life yeah?). So he walked me through it and finished all his frames. I took his place and Kinect automatically switched him out for me. 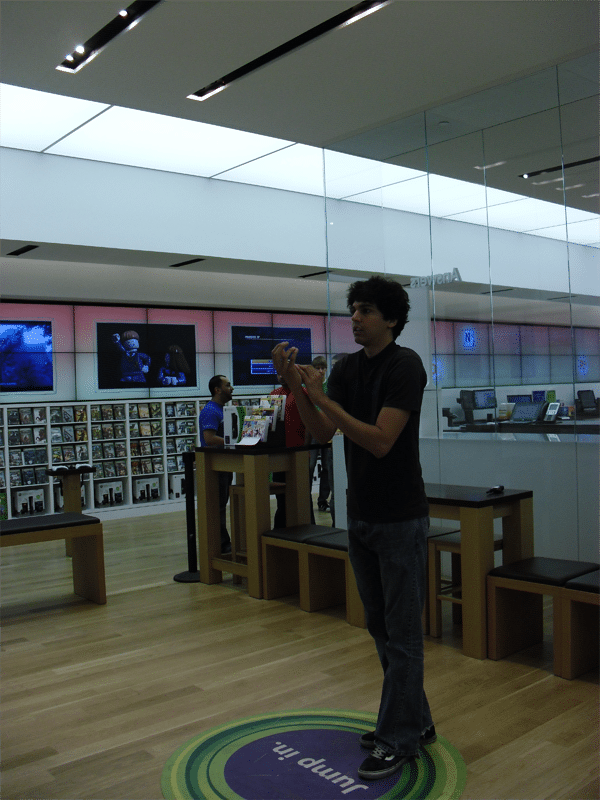 I was very slow and fragile at first still being foreign to Kinect. I slowing reached my right hand out taking the queues the game was giving me, my avatar doing the same and picked up my ball. It was a pretty red one. I then rolled it down and got a strike! I was super excited but was informed quickly that everyone always gets a strike on their first bowl. This guy is about to show me how to bowl it up. I then do this a couple of times, not the strikes, and I am feeling more confident and moving a bit faster not waiting for Sports to give me queues. I was told via the Rare twitter that you can granny roll but had to try it out for myself. And yes! You can granny roll! I got a strike with it too! The guy sitting down in the fancy suit and stuff told me I could twist my hand/arm to give the ball some spin. I did and indeed got some crazy spin on the ball. It was a little to the left and I got the split the next throw. 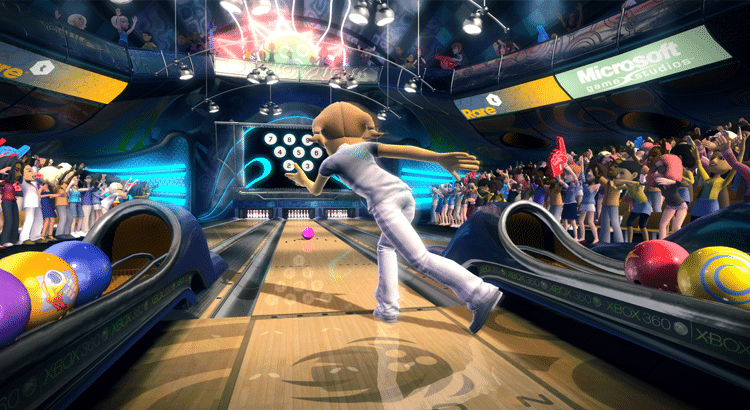 Bowling felt really natural and I feel even if that guy hadn’t given me a run down I would have been able to walk in front of the screen and known what to do and be decent at the game. I finished my frames and was heading out the exit but the guys could tell I was enjoying myself so one of them challenged me to the track and field Sports game. The track and field event was some number meter hurdle race. He started it up and informed me high knees is crucial. I did as he said and and ran the whole thing with my knees to my waist. You are informed to jump over the incoming hurdles by the hurdle color turning first yellow (warning you to get ready to jump) and then green (JUMP!) as you approach it which works out really nice. The high knees thing seemed to work and there was debate on whether or not your arms waving in a natural running motion made you run faster as well as opposed to leaving them at your side. I am jumping over some mad hurdle on the right! Well I raced twice and lost both times. I finally got kicked off as there was a long line of people waiting to play. Before I left we uploaded our video highlights to somewhere…they didn’t seem to know where it was uploading to but maybe one day I will find that video. Some other guys giving track a go. They were not very good. I think only one of them made it over one hurdle. 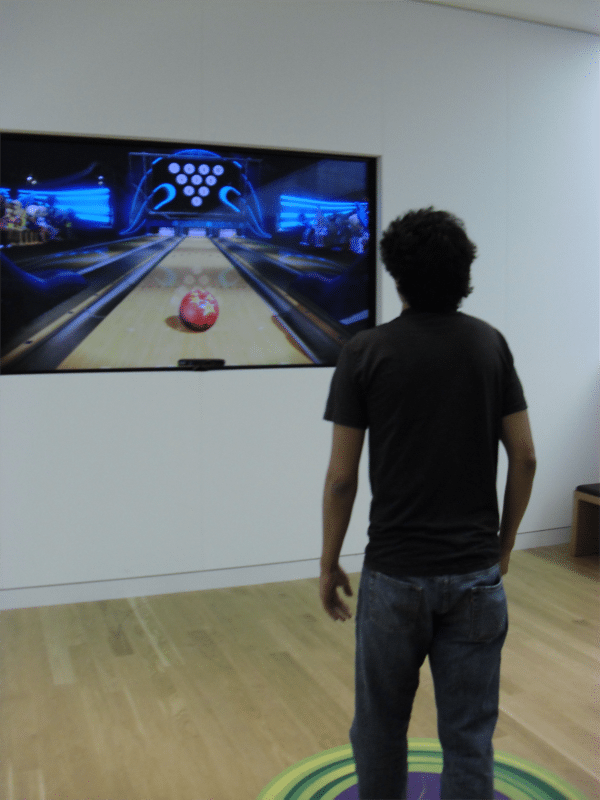 So overall Kinect was very impressive. 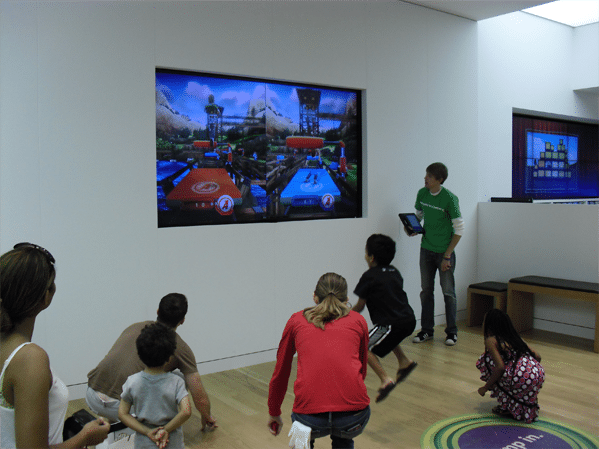 I didn’t notice too much lag with the Dodgeball game and none at all with Kinect Sports. Both bowling and track and field felt very natural and both activities picked up my body motions accurately. And oh man did I break a sweat with track and field. 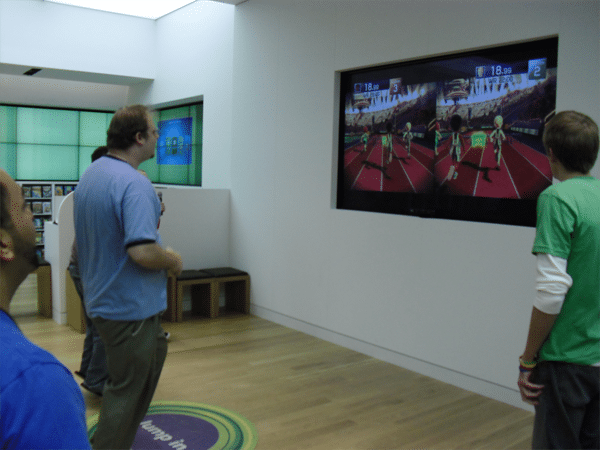 As for Kinect Sports, there is also boxing and table tennis but they were not available in this demo. I can imagine them being as fun as bowling and the hurdle race though! 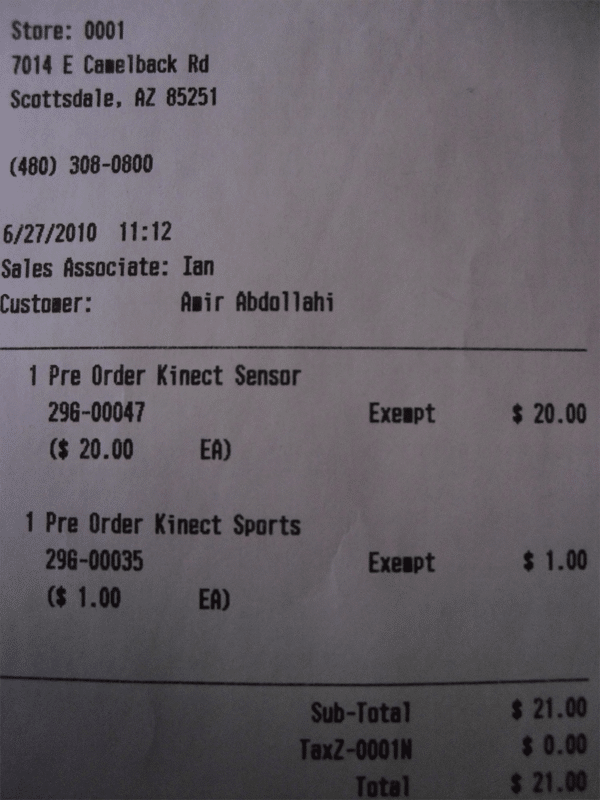 I pre-oreded the Kinect as well as Kinect Sports and can’t wait for November. 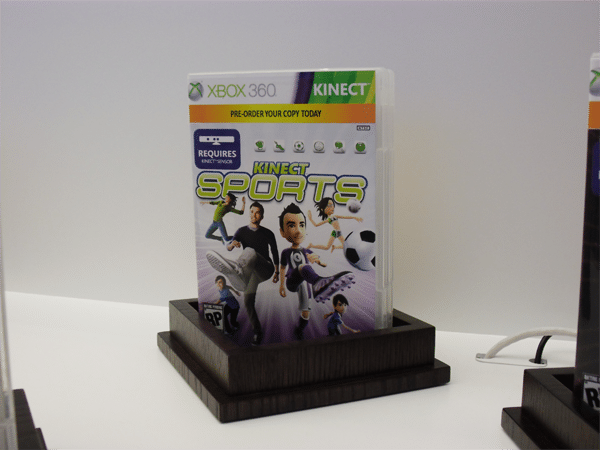 Kinect Sports pre-order! This could be the first one the in the world!